An essential tool for the safety & security of any organisation, the identity card provides an instant visual confirmation, & it is important therefore that your identity card supplier can provide you with a quality product. Our identity cards our produced to the highest standards using high quality colour photo reproduction with accurate flesh tones, & our advanced printing technology enables us to provide sharp & vivid text . 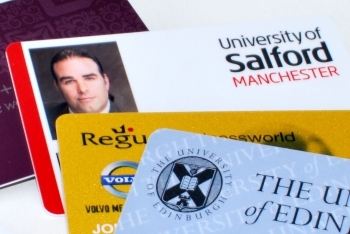 To combat card tampering, alteration, or counterfeiting, our identity cards are laminated with a highly protective seal to prevent fading & colour loss, thus creating an identity card that is both durable & long lasting. If added security is required, we can produce your identity cards with magnetic stripes, holograms, configured & encoded security chips, & many other features to deter forgery.